As one of Canada’s largest insurers, Industrial Alliance offers a full range of life and living benefits insurance, with an unparalleled flexibility in defining your insurance as it fits your need. 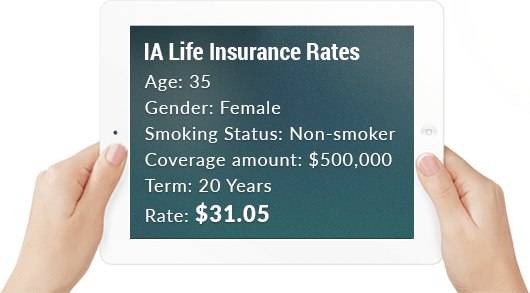 Among Industrial Alliance’s noted benefits is the ability to choose the exact length, coverage, and benefits you need for your life insurance plan. Pick-A-Term Life Any length between 10 and 40 years Ages 18 to 70 Choose the term length that’s right for you. Renewable and Convertible to age 75. Decreasing term insurance option available. Whole Life For life, payable in 10, 15, 20 years, to age 65, or to age 100 Ages 0 to 70 Level coverage with a minimum premium amount guaranteed. A cash value is available on this plan. Term 100 Life For Life Ages 0 to 85 A simple permanent plan with guaranteed level coverage and premiums. Life and Serenity 65 For life Ages 40 to 60 Provides both a death benefit and loss of independent existence monthly payment. Child Life & Health Duo For life, payable to age 30 Ages 0 to 20 Provides both life and illness coverage, with a 40% increase of coverage at no additional cost at adolescence. Universal Life – Genesis For life, payable in 10, 15, and 20 years Ages 0 to 85 Fixed indexed accounts that help you build long-term stability and wealth for your estate. Up to 9 insured may be on 1 policy. Universal Life – Trend For Life Ages 18 to 80 Provides a lower cost of insurance for the first 10 years of a policy, with a selection of investment accounts to maximize your growth. Guaranteed Life – Alternative For Life, option to pay in 20 years Ages 6 months to 80 Up to $100,000 with no medical exam or health questions. Option for indexed coverage to keep pace with inflation. Guaranteed Life – Perspective For Life Ages 35 to 75 Up to $100,000 with no medical exam or health questions. This plan has a guaranteed cash surrender value. Transition Critical Illness 10 years, to age 75, or to age 100 Ages 0 to 65 Covers 25 critical illnesses and 5 juvenile conditions. Option to receive a refund of premiums if no claim is made. The Kiddy Plan 12 months Ages 2 to 5 Up to $2,000 in coverage for a critical illness. We are pleased to offer all life insurance products provided by Industrial Alliance. For a quote on all available life insurance plans, please use our no-obligation quote provided on the right to explore your options and find the right fit for your needs.